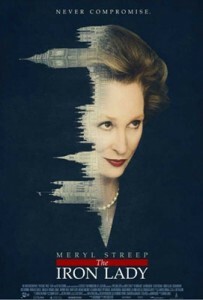 Framing Mrs. Thatcher’s story the film depicts the once-commanding leader in the midst of senility, contrasting it with her historic rise through the ranks of Britain’s Conservative Party. Like Ronald Reagan on our side of the pond, Mrs. Thatcher remains a polarizing figure, worshipped by the right and reviled by the left. Here, her fight against left-wing orthodoxy is depicted as ferocious and honorable. Much is made on-screen of Mrs. Thatcher’s smashing of the glass ceiling that kept British politics a virtual boy’s club.